Having set out in business with partner John Sinclair in 1844, James Paxton became a successful grocer and spirit merchant, on his own account. 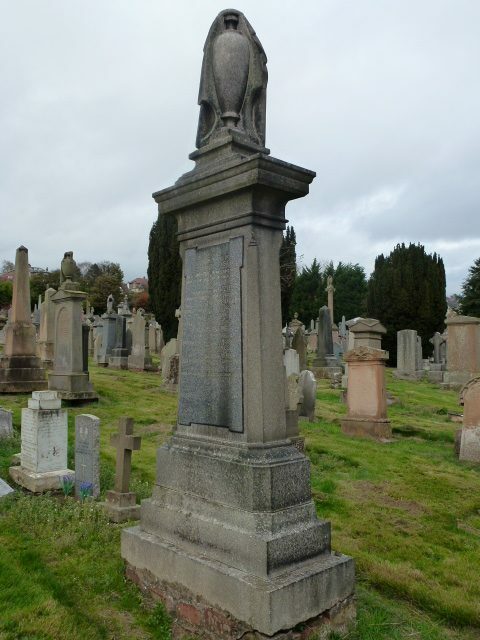 James' son John became a partner in his business which was located at the West Port, Dundee. In 1844, the local press in Dundee carried an advertisement for the establishment of a new business at 7 Reform Street - that of 'Paxton & Sinclair,' Tea & Coffee Warehouse. The advert stated that 'they (P & S) have opened the above central premises with a large and choice selection of TEAS & COFFEES ETC.' A year later, in 1845, the pair opened a second branch at 9 Union Street. The establishment there had been carried on by Mr J Dickinson and was transferred to Paxton & Sinclair in June 1845. It was reported that John Sinclair oversaw the Reform Street branch, while James Paxton oversaw the Union Street venture. Further expansion followed with premises at 35 West Port (circa 1848) and 77 King Street (circa 1852). The longest surviving premises were located at 17 & 19 West Port. For 10 years, Paxton & Sinclair enjoyed a thriving trade. 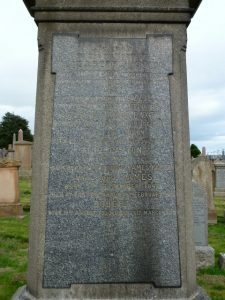 However, partner John Sinclair, who had previously been employed as a clerk, firstly with the Dundee Chronicle and thereafter with the Northern Warder was inclined to return to the newspaper industry. Although his business with James Paxton was a successful one, John Sinclair then relinquished his partnership with Paxton in 1855, in favour of a return to the Warder. Thereafter, from that point, James Paxton operated the Grocer & Spirit Merchant business on his own account . James Paxton, was born, one of twins, to William Paxton and Mary Ewart in the parish of Innerwick, Haddingtonshire (East Lothian). His father was recorded as having been a ‘Limeburner at Skateraw.’ There had been 2 lime kilns at Skateraw, close to the present site of Torness Power Station, 33 miles east of Edinburgh. Having come to Dundee as a young man, James Paxton was already enjoying a successful partnership in the grocery and spirits trade when he married Elizabeth Justice. A family of seven was born to the couple with their youngest son, John, ultimately entering into partnership with his father. Together, they continued the successful enterprise at West Port, under the title of James Paxton & Son, Grocers & Wine Merchants. In 1911, the business was further transferred to James Paxton Macqueen, James Paxton’s grandson (by his daughter, Mary Ewart Paxton/William Barrow Macqueen, Procurator Fiscal of Midlothian). The success of James Paxton’s enterprise was doubtless due, in part, to the experience of his partner, John Sinclair. Sinclair (a few years older than James) ‘originally trained to the grocery and provision business’ during the 1830s, prior to gaining employment in the newspaper trade. He was firstly employed with the ‘Dundee Chronicle.’ However, after the Chronicle was sold to the Chartist party (thereafter named the ‘Dundee Herald’), John Sinclair joined the staff of the ‘Northern Warder’ (started in the interests of the Free Church). Interrupted by 10 years of trading with James Paxton, Sinclair resumed a life in journalism by rekindling his association with the ‘Warder’ after having severed his partnership with Paxton. He then became joint proprietor of the ‘Warder’ together with Robert Park and architect, James McLaren, titling themselves, ‘Park, Sinclair & Co.’ That partnership also established the ‘Weekly News,’ the first ‘penny weekly’ in Scotland. After a further 10 years in journalism, Sinclair finally settled into life as a commission merchant, together with his son John. From 1844, James Paxton’s endeavour and toil resulted in a long established business which enjoyed enduring success. Old Parish Registers. Dundee. Marriages. (1846). 282/ 230 206. ScotlandsPeople website. Old Parish Registers. Dundee. Births. (1847). 282/ 190 305. ScotlandsPeople website. Old Parish Registers. Dundee. Births. (1850). 282/ 200 26. ScotlandsPeople website. Old Parish Registers. Dundee. Births. (1852). 282/ 200 83. ScotlandsPeople website. Old parish Registers. Dundee. Births. (1853). 282/ 200 123. ScotlandsPeople website. Statutory Registers. Dundee. Births. (1855). 282/ 2 635. ScotlandsPeople website. Statutory Registers. Dundee. Births. (1857). 282/ 2 878. ScotlandsPeople website. Statutory Registers. Dundee. Births. (1858) 282/ 2 1180. ScotlandsPeople website. The Dundee Directory, 1850. p.144. Dundee Central Library, Local Studies. The Dundee Directory, 1853-54. p.201. Dundee Central Library, Local Studies. The Dundee Directory, 1856-57. p.129. Dundee Central Library, Local Studies. The Post Office Dundee Directory, 1858-59. p.173. Dundee Central Library, Local Studies. The Post Office Dundee Directory, 1861-62. p.192. Dundee Central Library, Local Studies. The Post Office Dundee Directory, 1864-65. p.170. Dundee Central Library, Local Studies. The Post Office Dundee Directory, 1867-68. p.180. Dundee Central Library, Local Studies. Statutory Registers. Dundee. Deaths. (1903). 282/ 1 335. ScotlandsPeople website. Western Cemetery. Compartment 6. Friends of Dundee City Archives website. Dundee Courier, 22 July 1868. p3. Findmypast website. The Burgess Roll, The Lockit Book. (1869). Friends of Dundee City Archives website. Dundee Postal Directory, 1884-85. p.65. Dundee Central Library, Local Studies. Dundee Courier, 10 January 1884. p3. Findmypast website. Dundee Courier, 4 June 1844. p.3. Findmypast website. Northern Warder & General Advertiser, 5 June 1845. p.1. Findmypast website. Dundee Courier, 24 May 1848. p.4. Findmypast website. Dundee Courier, 7 October 1896. p.4. Findmypast website. Dundee, Perth & Cupar Advertiser, 16 March 1855. p.2. Findmypast website. Dundee Courier, 21 November 1911. p.1. Findmypast website. The information above about James Paxton has been collated from a range of digital and hard copy sources. To the best of our knowledge it is correct but if you are relying on any information from our website for the purpose of your own research we would advise you to follow up the sources to your own satisfaction. If you are aware of an inaccuracy in our text please do not hesitate to notify us through our Contact page.